Not a recipe day. Not a “save time, serve a deli­cious meal” day. No, not at all. How about a “For­get it. Let’s go to Burg­er King,” day? I’d start­ed with a pound of ham­burg­er, plan­ning a meat­loaf, our per­son­al fam­i­ly favorite. Yum­my meal and sev­er­al cold sand­wich­es in the future. But I suc­cumbed to anoth­er idea. Must admit that was a stretch. Filled pep­per. But that’s anoth­er sto­ry about some­thing we did eat, but don’t plan to try again. Back to today’s dis­as­ter. First thing, it took an hour of my time. Sec­ond thing, it took a lot of oth­er gro­ceries that could have been bet­ter spent. Two eggs, a quar­ter of a pound of but­ter, two, count them, two cups of shred­ded cheese, ketchup, mus­tard, milk, flour, sug­ar. Sug­ar? The recipe made way more than two of us could eat. (Espe­cial­ly since hub­by ate only one.) I sol­diered on, not sure why, and ate three. Or was it four? Nope, I’m sure I filled up with three. How­ev­er, a few of those good words were, “freezes well.” So now I have at least a dozen of those lit­tle nuggets of delight in the freez­er. 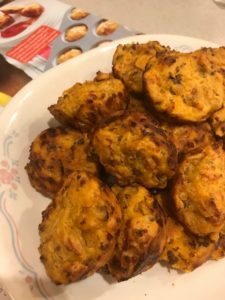 Per­haps I’ll serve them to grand­chil­dren, nat­u­ral­ly using words like, “a go-to snack when you’re dying for a yum­my cheese­burg­er!” I won’t show them the pic­ture from the recipe book that shows them plump and rosy with­out those singed edges that result­ed from the min­i­mal cook time.